The experts at PGRS: Professional Grade Roofing + Siding can install quality gutters that will provide effective roof drainage year round! Contact us today to get a free estimate on new or replacement gutters and downspouts throughout the Metro Atlanta area! Mr. S is a resident in Stockbridge, Georgia who had an already failing gutter system, but once a harsh storm came through one afternoon it completely tore a section of gutters off on the back side of his home. He called Professional Grade Roofing and Siding to provide him a free estimate for replacement, he liked PGRS, his project manager Steve, and our price! He decided to have PGRS install a new gutter system as well as LeaFree Gutter Covers! Frank is a resident of Jonesboro, Georgia. His existing gutters were in complete failure. They constantly clog and overflow and some are completely detached from the home. He researched online and asked for references from the ones he trusts for reputable companies to come out and get the job done. Frank loved the reviews he saw on Google and PGRS’s Facebook Page and called us to come out and perform a free estimate! We sent out our Project Manager, Jason, and after his thorough inspection of the exterior of Frank’s home was complete Jason informed him in order to fix all of his problems we needed to replace gutter system and repair all damaged fascia board, resulting in a gutter system that will provide many years of good worry-free service to Frank and his family. Frank is all so a long time repeating customer of ours which qualified him for some great special pricing options. Call us today for your free estimate! A poorly positioned gutter and downspout caused pooling on the roof. PGRS removed the old gutter and downspout and moved the downspout forward for proper water flow away from the roof. Call today if you're dealing with gutter problems and we'll provide a free estimate! Rain gutters must slope toward the downspout! Pitch plays such an important role in gutter function. The gutter on this customer's back porch was pitched to the side without the downspout. This caused the water to collect and stay in that one side of the gutter. The weight of the water casued the gutter and fascia board to separate from the home. PGRS replaced the separating fascia board and installed a new gutter with proper pitch to ensure appropriate water flow. This customer had a new roof and gutters installed in 2008. A local competitor performed the work and the shingles used were about 65% deregulated and there are some areas where the gutters were more than 8' apart. That result was that the gutters were filling up with shingle grit, and not having the proper attachment hardware caused the gutters to fall off of the house. PGRS had the perfect solution for this customer which was replacing the damaged gutters, cleaning out all of the shingle grit from all gutters and securing the correct attachment hardware to all of the gutters. This will prevent this problem from ever happening and our customer could not be any happier! Here at PGRS we pride ourselves in quality work and attention to detail with the customer's best interested in mind. Mr. & Mrs. L are tired of painting their soffits and fascia every few years. They are also tired of their gutters causing damage to their fascia. Mr. L expressed that he is looking for soffits and fascia that are maintenance-free and a properly functioning gutter system. After seeing the presentation, pricing, and financing options, they decided to try to qualify for financing. They were approved and now will get long-lasting, maintenance-free soffits and fascia and properly functioning gutters and downspouts. Mr. Adefisayo was looking to spruce up the exterior of his home before Spring, he reached out to PGRS for an estimate to do just that. His Project Manager, Mark, met with him and went over all of the updates he wanted to make so he could put an estimate together for exacly what he was looking for. Mr. Adefisayo decided to replace his gutters and paint the stucco, fascia & soffit, garage doors, deck & railings, and retaining wall on his home! 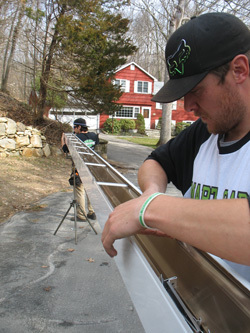 He loves the details his new gutter system adds to his home and can't wait for Spring! This customer in Fayetteville had old galvanized steel gutters that had rusted out causing rot in the fascia board. PGRS removed the old gutters, repaired the fascia rot and installed seamless aluminum gutters that will not ever leak. One happy homeowner!! David is a resident of Fayetteville, Georgia and the gutters on his home were very overflowed and caused significant damage to his fascia and soffits. After meeting with our Project Manager, Jason, David decided to have PGRS remove the existing gutters and damaged fascia and soffit and then install new vinyl soffits, aluminum fascia wrap, and a new 6 inch seamless aluminum gutter system. This Fayetteville homeowner wanted to revamp his home with new siding and gutters. As you can see - his home is surrounding by a large degree of vegetation. We made sure that the homeowner was happy with the products and installation that we were able to provide. Call us today for a free estimate on your home! The Christopher's live in Fayetteville, Georgia and during a recent storm a tree fell on their home and damaged their roof gutters and a section of their siding. Our Project Manager, Jason, went out to their home to assess the damages and quote them on all of the repairs needed. The Christopher’s were pleased with the price as they expected it to be much more expensive! Diverting water away from your house is important for many reasons. As your foundation wears down, water can seep into the walls. The absence of gutters on the front of this home caused the homeowner concerns. PGRS installed 6” seamless aluminum gutters with 3”x 4” downspouts and attached them to three french drain pipes. Be worry free and water free .. Call PGRS today for a free home inspection. What color should your gutters be? The cardinal rule for choosing gutters that will look good, not just function well, is to choose a low-key color. You’re generally left with three options for color: the same as your siding, same color as the trim or same color of the roof. So which one is right for you? An experienced PGRS Project Manager can guide you through the color selection process and discuss the pros and cons of making your gutters blend in or having them add visual interest. This homeowner replaced their old gutters that matched the roof color with new 6” seamless aluminum gutters in white to match the trim. What gutter color is right for you? 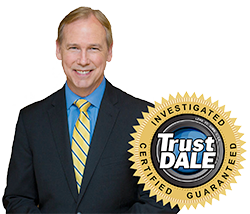 Call us today to set up a free consultation. The Lehew's live in Fayetteville, Georgia and they had old 5" gutters that were overflowing and causing damage to the soffits on their home. They knew they wanted a new gutter system but just didn’t know who to go with. 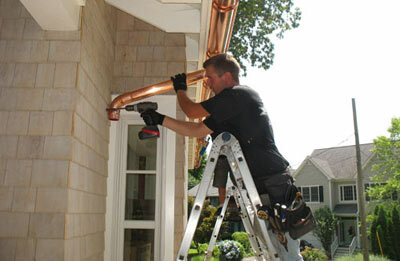 When they searched gutter replacement on the internet PGRS was one of the first to pop up! The Lehew’s gave us a call and we came out to quote them exactly what they asked for and could actually educate them on a couple items which made the process that much easier for them! They decided on new 6" seamless aluminum gutters that are capable of handling all the rainwater coming off of their roof. Mrs. Lehew heads up the HOA for her neighborhood, Timberlake, and she has agreed to list PGRS in the next newsletter! So if you’re in that area and can use any of our roof, siding, gutters, window, etc. assistance, give us a call today! Old undersized gutters caused a couple of roof leaks and damaged soffit. PGRS installed 5" seamless aluminum gutters and 3"x4" downspouts along with 5" screen gutter covers to prevent and future water damage. New 6” seamless aluminum gutters complete with Leaf Sentry Lifetime No Clog Gutter Guards finally allows this homeowner to spread mulch around the landscaping without watching it wash away after a summer shower. When you partner with PGRS, not only do you receive first class customer service, you receive the experience and expertise to handle your home improvement projects so you can enjoy your home! Stop dealing with rain water drainage issues and call us today for a free estimate. Juan is a Tyrone resident and has been having trouble with his gutters overflowing and causing erosion around his home. After we sent out our Project Manager and he completed his thorough inspection we discovered his Juan's gutter was full of debris and too small for his home. Our Project Manager presented Juan with a couple different options and he decided on installing 6" Seamless Aluminum Gutters and LeaFree gutter protection that has a Lifetime No-Clog Warranty. Mr. Mendez can now live worry-free knowing his gutter will never get clogged again. Proper placement of gutter downspouts is key to keeping water away from the home's foundation and preventing costly future repairs. When PGRS replaces gutters on a home, our experts carefully place downspouts, or in this case, add additional downspouts with the goal of getting all rainwater to run off the home. The simple act of downspout location can prevent soil erosion and keep water from rising above the foundation wall. Ms. A had new Gutters & Gutter Guards installed by PGRS 4 years ago. She did not have downspouts replaced when she replaced the gutters. She had one downspout that did not meet the corrugated drain piping and had rigged something up so that water goes into the piping. She also had water spilling over the gutters and gutter guards at her back porch. Our Project Manager, TJ, discovered that she only experiences the overflow in heavy rains he determined that Ms. A had multiple pitches of roofing draining into a small section of gutter. TJ suggested we install 20-22 feet of water diverters and install a new downspout to solve her issues. She agreed to the solution and signed up right away, knowing from her previous experience with us that she could trust us to get the job done right! This Peachtree City customer recently built an addition to the back of the home that needed gutters. After meeting with a PGRS Project Manager, they decided to move forward with gutters for the new addition as well as LeaFree™ gutter protection. LeaFree™ patent-pending design allows water to enter the gutter while keeping leaves and debris out. The design is custom fit to any home and is adjusted to any roof pitch. LeaFree™ does not install over additional hangers or brackets that can move or shift over time. The panels are only screwed into the lip of the gutter and not into the roof or fascia. Call PGRS to learn more about the many benefits of adding gutter guards to your home. Beautiful home transformation! Our Project Managers partner with you to make your vision for your home makeover a reality. The decorative collector boxes on the aluminum gutter downspouts add to the updated English Cottage look the homeowner wanted to achieve. Professional Grade Roofing Solutions was able to coordinate with this customer’s painter of choice to remove the gutters before the paint job and then install 6” seamless aluminum 30 Degree White gutters after the painting was completed. Clear communication every step of the way with the customer and the additional contractor facilitated this end result. When you hire someone to build an addition onto your home, you expect to get what you paid for. You expect the job to be done properly with expert craftsmanship. You do not expect to have to hire someone else to come fix it right. Sadly this is exactly what happened to our customer in Fayetteville. When the screened in porch addition was finished on her home, she had gutters that were improperly installed and roof flashing that did not tie into the rest of the roof to allow for proper water runoff. This can cause a lot of damage to her roof. She called PGRS for help. We went right out and inspected the problem area. We found the contractor did a poor job of installing the soffit and gutters and he did not tie in the roof flashing, thus creating the problem. To fix it we correctly installed vinyl soffits, fascia metal, and 6" gutters and downspouts. We also corrected the improper roof flashing. Save yourself the trouble and hire PGRS from the start!! PGRS installed new aluminum 6" seamless gutters and re-positioned existing downspouts. Call today for your free estimate! After a careful inspection, the PGRS Project Manager recommended we install new 6" seamless aluminum gutters and downspouts for most of the home. There was a section of gutter at the front of the home that was in good condition. It only needed to be re-pitched and new hangers added. PGRS works with homeowners to do what is best for them. Not what is best for our bottom-line. We believe doing the right thing, in this case using some of the existing gutter, is ultimately what makes our company strong. Putting the customer’s needs first is our top priority. PGRS installed a 6" half round gutter system which spruced up this home for resale. Materials: Historically, gutters have been made from many different materials, including wood, steel, copper and seamless aluminum gutters. Aluminum gutters are most popular today because of their affordability, durability and color variety. 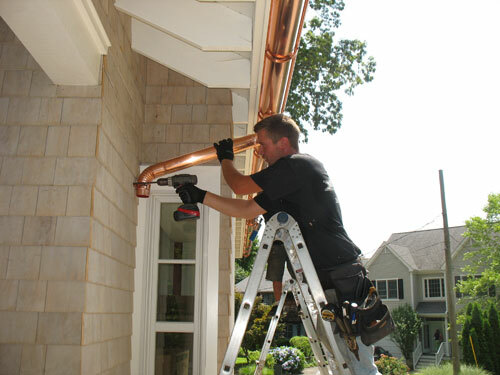 Our gutter experts draw on their extensive knowledge and installation experience when evaluating your home. We can spot related problems such as damaged flashing or rotted fascia boards that require replacement or damaged flashing. In addition to gutter and downspout installation, we also install gutter guards to keep your gutter system performing like it should. Contact the roofing and gutter experts at PGRS: Professional Grade Roofing + Siding by calling 1-855-557-5113 or fill out the online form for a free inspection and estimate! We offer all our gutter services in Smyrna, Atlanta, Newnan, Mableton, Fayetteville, Ellenwood, Douglasville, Stockbridge, Carrollton, Peachtree City and throughout the surrounding areas.